Offering you a complete choice of products which include waste water evaporators and multi effect evaporators. We are the leading Indian manufacturer of Waste Water Evaporators. Our systems help separate distilled water from all kinds of effluent untreated waste water. The result is Clean Distilled Water on one side and Effluent slurry on the other. 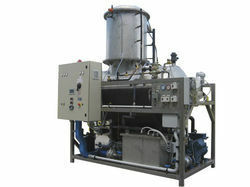 Waste Water Evaporators is a technique that represents a major breakthrough in the treatment of liquid effluents as it allows effluents that cannot viably be treated using physicochemical or biological techniques to be treated in a clean, efficient, safe and compact manner. Vacuum evaporation results in a dramatic reduction in the volume of liquid waste the concentration of corrosive or scale-producing waste, reuse of the water recovered and the implementation of a zero-waste system, amongst many other advantages. Industries such as Pharmaceutical and Textiles have huge benefits from these units as it acts as a single and efficient source of Effluent Treatment. We are the leading Indian manufacturer of Multi Effect Water Evaporators ( Vacuum Evaporator ). Our systems help separate distilled water from all kinds of effluent untreated waste water. Multi Effect Water Evaporators is a technique that represents a major breakthrough in the treatment of liquid effluents as it allows effluents that cannot viably be treated using physicochemical or biological techniques to be treated in a clean, efficient, safe and compact manner. Vacuum evaporation results in a dramatic reduction in the volume of liquid waste the concentration of corrosive or scale-producing waste, reuse of the water recovered and the implementation of a zero-waste system, amongst many other advantages. Highly efficient and easy to maintain. Running cost much lower than conventional systems. 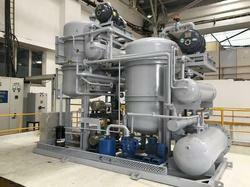 Looking for Water Evaporators ?